The start to the new campaign was quite tumultuous but Arsene Wenger has done his bit to steady the ship with two wins and a creditable draw at Stamford Bridge in the last three Premier League games. With half an eye on Sunday’s lunch time kickoff against Brighton Hove and Albion, it was evident that he was going to rest a host of players ahead of the Europa League tie against BATE Borisov. There were pictures that surfaced online before the game, showing ex-BATE and Arsenal player, Aliaksandr Hleb, catching up with the squad and taking a selfie with his former boss. Hleb was one of those players that made a great impact in the squad, being an integral part of that fantastic four midfield that challenged for the league in the 2007/08 season. Many would regard his departure to Barcelona as a terrible mistake as his career went downhill, but these things happen. David Ospina rightly took his place in goal and with Calum Chambers still injured, Skhodran Mustafi retained his place in the defense alongside club captain, Per Mertesacker and upcoming youngster, Rob Holding completing the back three. The midfield quarter was made up of youngsters like Joe Willock, Ainsley Maitland-Niles and Reiss Nelson, with Mo Elneny providing the much-needed experience. Hector Bellerin was badly in need of a breather and with Alex Oxlade-Chamberlain gone to Liverpool’s bench, Carl Jenkinson out on loan and Matt Debuchy clearly out of favor, it seems like the way has been paved for Reiss Nelson to deputize in Bellerin’s stead. Jack Wilshere and Theo Walcott played behind Olivier Giroud that was still in search of his century of goals at the club. The Gunners started the game on the front foot and finally got the lead their play deserved when Wilshere connected with Giroud before cutting the ball back from the byline. The lofted ball was headed goalwards by Walcott but Scherbitski made a superb save. Fortunately for the English winger, he was on hand to tap in the rebound. If there was some difficulty about the game’s opener, there were no problems with Arsenal’s second goal as a defensive error from the BATE Borisov defense left Walcott clear on goal with the goalie and he wasted no time in smashing in his second of the night. The game was turning into a rout for Arsenal as Holding reacted fast to Mertesacker’s knockdown from a corner kick to score his first Arsenal goal. Three goals up and the Gunners were cruising but BATE got a goal back through their star attacking midfielder, Ivanic. Arsenal extended their lead from the penalty spot through Giroud, and it turned out to be an emotional moment for him as he joined the elite league of Arsenal forwards to score 100 goals for the club. Say what you want about Giroud, but he has matured a lot from that young forward in Montpellier to his bearded bloke that has popped up with really important goals for his team. A defensive error from Holding saw Gordeichuk pull one back for BATE but Arsenal had Ospina to thank for keeping the scoreline at bay as the Colombian shot stopper worked overtime with a plethora of important saves. In the end if was a satisfying result against a team the Gunners had never played before and with many star names rested, the Gunners will be fresh for their encounter against Brighton on Sunday. 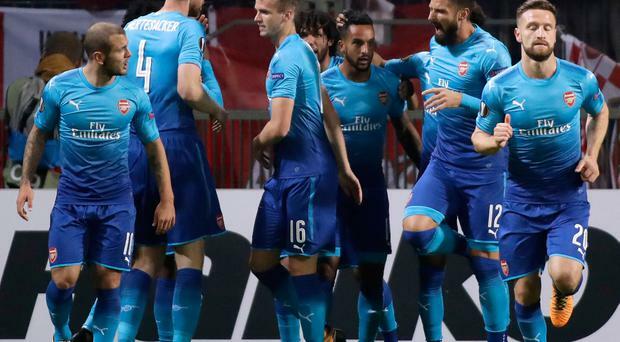 The reality of finishing below the Champions League for the first time in umpteen years is finally setting in as Arsenal host FC Cologne in the Europa League – Europe’s second tier competition. Many are obviously disappointed about the team appearing in this competition, especially how we have spent loads of seasons in the Champions League, but I look at it as a fresh opportunity for the boss to feature some players that wouldn’t be chanced to play regular Premier League football. As expected, there were a host of players that have been rested for the spicy encounter against Chelsea at Stamford Bridge, and there would be lads with something to prove in the new campaign. David Ospina knows in his heart of hearts that he can never replace Petr Cech as the team’s custodian between the sticks bar some bizarre injury to the legendary Czech goalie but the departures of Wojciech Szczesny and Emiliano Martinez (on loan) was a clear indication to Ospina that his services are still required at the club. While Cech does the business in the Premier League, Ospina has to make do with the Cup competitions and just live with it. In defense, I am hoping to see the likes of Rob Holding and Calum Chambers that have fallen out of favor with the manager. Despite a stellar breakthrough debut campaign last season, Holding has struggled badly in games against Leicester and Liverpool, with the manager openly saying that he has lost some confidence. The last time he mentioned such words about an Arsenal player following a bad performance, that was it with his Arsenal career, and he’s currently on a treatment table at Birmingham. I really don’t know what happened between Calum Chambers and the manager but I was actually hopeful he would build on his good campaign with Middlesbrough despite their relegation. With Oxlade-Chamberlain out of the equation, the manager has to determine the right wing back that would play tonight, as Hector Bellerin deserves a breather. Reiss Nelson would have been a nice option, but I’d prefer him in a more advanced position, which could mean a player like Ainsley Maitland-Niles could get a run out there. On the left, Sead Kolasinac would want to get a run out against a Bundesliga side due to his close ties to German football. I’d expect some changes in midfield as well with our first choice central midfield pairing, Granit Xhaka and Aaron Ramsey, getting some deserved rest, as they would be required to work overtime against Chelsea’s industrious midfielders. This should give room for the likes of Mohamed Elneny and more interestingly, Jack Wilshere, to feature for the first team. Like Alexis Sanchez and Mesut Ozil, Wilshere is one of those players with months left in his contract, and this would be an interesting season for him. Finally, we are bound to see Olivier Giroud spearhead the attack tonight. It was always going to be a struggle for the Frenchman following the arrival of his compatriot, Alexandre Lacazette, from Lyon. The newbie has been adapting to life in North London, and his two goals so far would keep the monkeys off his back, even though we expect more. FC Cologne are struggling in the Bundesliga but Arsenal should not allow complacency creep into their game tonight. I’m also hoping the new lads featuring tonight will not have disjointed performances. It’s a new adventure in the Europa League and I hope the lads are up to it.